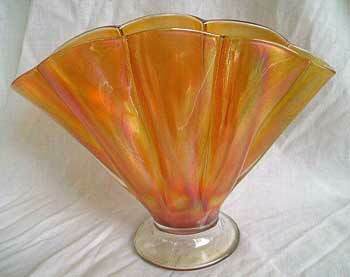 Larry Ashley sent me this photo of an 8-inch Fenton #857 Melon Rib fan vase in marigold. What's unusual is that it doesn't have the usual stretch iridescence. Note the clear base. Quite rare in this form. In 2016, three Melon Rib fan vases with stretch iridesence sold. One listed as Velva Rose brought $10, one listed as Grecian gold sold for $30, and one listed as Tangerine brought $60.